For a while it seemed that the drones project had been restrained following a flood of public criticism last year. Reports from United Nations Special Rapporteurs, and mainstream NGOs like Human Rights Watch and Amnesty International clearly documented violations of International Humanitarian and Human Rights Law by Drone strikes in Pakistan and Yemen, countries the US is not at war with. US attempts to justify the strikes were clearly inadequate but strikes dwindled so the discussion around Drones lost it’s allure. I warned last fall that this is was just a superficial misdirection while all the corporate and pentagon initiatives remained on track . Today the drones are back in force and legality seems a forgotten issue. ISIS is on the front burner with Iraq and Syria facing airstrikes with no mandate from Congress and none from the United Nations. The Syrian authorities have been advised, but not invited to comment. The government in Iraq is struggling. They will take assistance from anyone in any form. The Pakistani army made a problematic drive into the Tribal Lands to wipe out Taliban centers, then fell silent as US drones resumed bombing there. Yemen is in complete disarray with disaffected Houthis holding the US supported puppet government at bay. International Humanitarian Law has been forgotten. Russia is embroiled with the western attack on neighboring Ukraine, and Iran is hunkered down in formal negotiations over their nuclear program and US sanctions. Today(Friday, 11/7): Two men were riding a motorcycle. A drone fired missiles at them. Their bodies were charred. Yesterday: Overnight, five people were killed, their bodies ‘obliterated beyond recognition’. Oct 9: Two more missiles, Three people killed. Sixth CIA drone strike since Sunday. Note that the app doesn’t talk about ‘militants’, but most of the articles in the mainstream media do. The fact is that in most stirkes, the victims are not identified as individuals. They are anonymous ‘militants’. Even when an occasional identified ‘high value’ target is ‘taken out’, the people around him are not considered. Often these men are struck at home with their families around them, wives, children, mothers, sons and daughters; people whose lives are apparently deemed to be of no consequence. These are clear violations of international human rights law and of humanitarian law as well. Under Human Rights Law, it is never permissible to use lethal force against an unidentified individual unless another life is threatened. Even in war, it is not acceptable to follow your enemy home and kill him in his bed with his wife, surrounded by other family members. According to The Bureau of Investigative Journalism, an an independent not-for-profit organisation that pursues journalism which is of public benefit, Only 4% of drone victims are members of Al Qaeda. As the U.S. winds down the forces on the ground in Afghanistan, we must remember that the previous president, Hamid Karzai repeatedly complained about U.S. Drone strikes killing civilians. And, with a new President, and a new Status of Forces agreement in effect to protect U.S. forces from the local justice system, the situation is likely to become more dire. The us does not track drone strikes separately from other air strikes in Afghanistan, at least not publicly. In July of this year, The Bureau of Investigative Journalism (TBIJ) released a report  showing that drone strikes in Afghanistan are not being, and have not been tracked reliably. According to the report Afghan drone strikes are not only lumped in with all air strikes, but air strikes in Afghanistan are not reliably reported in any case. Afghanistan is the most heavily drone-bombed country in the world. Data released to the Bureau in 2012 by the US military showed that over 1,000 drone strikes conducted by British and US-operated drones have hit the country – more than in Pakistan, Yemen and Somalia combined. But little is known about where drones have struck, or who they have killed. Numerous organisations track civilian casualties in Afghanistan, and the UN Assistance Mission in Afghanistan earlier this year reported a steep rise in civilian drone deaths. An article by Chris Cole on Drone Wars UK , cites two data sets compiled from CENTCOM (US Central Command on the Persian Gulf) daily reports and those of our European allies, gives an idea of drone strikes in Iraq and Syria  . The US does not report the results of strikes by it’s regional allies, Saudi Arabia, Jordan, United Arab Emirates, Bahrain and Qatar. The claim is they are included in US strikes. They also don’t report drone strikes separately from other airstrikes, though there are many drones in operation there. 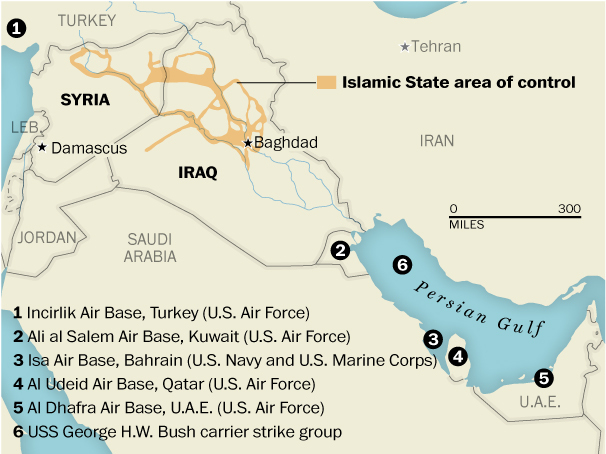 The US airstrikes in Iraq and Syria are flown from a carrier in the Persian Gulf and from Kuwait and most likely, the Emirates. There is a growing CIA presence in Erbil (Capital City of Iraqi Kurdistan), and though the military denies launching drones from Erbil, Cole believes it is likely the CIA is doing so. The Syrian Observatory says that 550 people have been killed by airstrikes in Syria, of which 32 were civilian. Cole reports 57 credible reports of civilian deaths for airstrikes in Iraq and Syria to date. So far as we know, only surveillance drones are flown from the US airbase Incirlik, in Turkey. The assessments of the proportion noted above of civilians killed by drone strikes as opposed to manned airstrikes in Afghanistan is likely the case here as well. That is, it is likely that more civilian deaths result from drone strikes than from other airstrikes. As I pointed out at the beginning of this article, US airstrikes are taking place without a UN Resolution, or even Congressional approval. The UK has committed four Reaper drones to the project, also without Parliamentary approval. Up until about a year ago, the anti-war movement was on fire over US Drone attacks, making and distributing films, following families of those killed and engaging in passionate discussions of international law and hounding the President and Congress. Sure, there are new wars to consider, but the old wars continue, along with the old violations. Weaponized drones enacting ‘targeted killing’ remain in the vanguard. It is time for a resurgence in the anti-drone movement, and more consideration of the atrocities that result from so called ‘targeted assassination’ by the United Nations and International Human Rights NGOs, not to mention the mainstream press coverage. Commercial drones on home turf represent a huge opportunity for business and a significant risk for air traffic control. While some countries forge ahead with new commercial drone regulations, the US Federal Aviation Administration has been criticized for its slow progress. Though with such advantage, there are many disadvantages that keeps the birds on threat.